Solid synthetic surfaces for tub and shower surrounds are becoming increasingly popular. Although they may not have a reputation for being a luxury design choice, that too is changing. Technology has improved the appearance and durability of synthetic so much that it’s hard to tell the difference between solid bath or shower wall panels and real stone or tile. Five Star Products offers beautiful synthetic alternatives to tile and natural stone bath and shower wall systems. 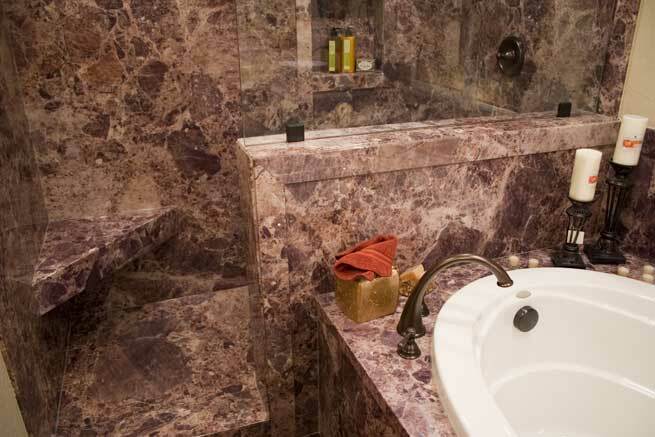 Five Star Products synthetic bath wall surfaces are made to look just like natural stone surfaces, such as marble or granite. A couple advantage of synthetic over actual stone are: the care requirements for solid surface panel walls are significantly less demanding and the price for synthetic is much more affordable than real stone. Synthetic bath wall surfaces by Five Star also come in tile patterns. If you have ever had tile, you already know why this is a big deal. No grout! No grout means no more tedious scrubbing, sealing, or replacement the grout between every tile on a routine basis. You can have the appearance of tile in your bath or shower area in a variety of shapes and sizes without the headache of taking care of grout. The available styles include: Cobblestone, Flagstone, Subway, Smooth, 12×12 Roma, 8×8 Textured and more. Because Five Star Products synthetic tub and shower enclosure panels are completely solid, there are no tiny pores for microbes to make a home in. Without places for microbes to take hold, it’s much more difficult for mold and mildew to start growing. The smooth surface allows for easy cleaning. With Five Star Synthetic panels, you’ll no longer need a scrub brush to get into the crevasses between tile, which is a time-consuming process. Because Five Star Products solid tub and shower wall systems are so smooth, they are faster and easier to clean. All you need is a the right cleaning solution and a cloth. No tub or shower alcove is perfectly square. Some are actually designed with half wall partitions or decks that must also be covered in a waterproof material. Solid bath wall panels are completely customizable to the original area of your tub or shower, whatever the shape, size, or imperfections. Five Star Products solid bath and shower walls are designed to last for the life of the home. They are scratch resistant, and UV resistant so it won’t fade with time or sun exposure. Five Star Product’s solid bath walls are guaranteed to last for the life of the bathroom. Synthetic bath and shower walls are a great option for any bathroom. With the beautiful appearance, low maintenance, and durability, you’ll love Five Star Products solid walls in your tub or shower. For before and after images of Five Star Bath Solutions bath renovation work, follow us on Facebook. With the best bath renovation material around, Five Star Bath Solutions will transform your tub or shower. We can take it from bland, colorless, or gross, and turn it into a beautiful and easy to clean sanctuary. Bathrooms are one of the most important parts of the house, which is why we work fast to complete the renovation and do it right. In some cases, we can transform your bath in as little as a day. After we are finished, we’ll leave the area clean. We have service areas in Canada and the U.S.. Call now to schedule a free estimate with Five Star Bath Solutions. The post Benefits of Installing Solid Walls in Your Shower/Tub Area appeared first on .